Aerosol optical thickness is considered to be the most important unknown parameter of every atmospheric correction approach for removing atmospheric effects from satellite remotely sensed images. This study presents a description of the basics of the proposed atmospheric correction procedure, which combines the darkest object subtraction principle and the radiative transfer equations. The method considers the true reflectance values of the selected dark targets acquired in situ and the atmospheric parameters such as the aerosol single scattering phase function, single scattering albedo and water vapour absorption, which are also found from ground measurements. The proposed procedure is applicable to short wavelengths such as Landsat TM band 1, 2 and ASTER band 1 in which water vapour absorption is negligible. The proposed image processing method has been tested successfully to determine the aerosol optical thickness on Landsat-5/TM images of the Lower Thames Valley area located to West London (UK) in the vicinity of Heathrow Airport and to Landsat TM/ETM+ and ASTER images of an area located in the vicinity of Paphos International Airport (Cyprus). The determined aerosol optical thicknesses for the Heathrow Airport area were 0.60, 013 and 0.75 for the Landsat TM images (0.45–0.52 µm) acquired on 17th of May 1985, 2nd of June 1985 and 4th of July 1985. The determined aerosol optical thicknesses for the ASTER (0.52–0.60 µm) images acquired on the 4th of February 2008, 26th of February 2008, 17th of December and 24th of December 2007 were 0.18, 0.39, 0.49 and 0.90, respectively. The accuracy assessment applied using the in situ spectroradiometric and sun-photometer data during the satellite overpass acquired on July–August 2008 for the Paphos area in Cyprus shows satisfactory results both for removing the atmospheric effects and for determining the aerosol optical thickness. Indeed, the high correlation between the determined aerosol optical thickness and those extracted from the visibility values increases the potential of the proposed method. The objective of any atmospheric correction method is to determine the atmospheric effects. A promising use of the determined atmospheric effects is to examine how the atmospheric pollution can be assessed through the derived aerosol optical parameters. Several methods for removing atmospheric effects have been developed from various researchers either simple or sophisticated (Hadjimitsis 1997; Hadjimitsis et al. 1999a,b; Hadjimitsis et al. 2004). One of the simplest atmospheric correction methods is the darkest object subtraction (DOS) approach or darkest pixel method (DP) (Campbell 1993). The DOS approach assumes that the pixel with the lowest digital number (DN) in each band should, in reality, be zero, and therefore, its radiometric DN value represents the atmospheric additive effect (Crane 1971; Crippen 1987; Campbell 1996; Hadjimitsis et al. 2003). The DP may correspond to a large water body or other dark object or feature within the scene. The principle of the DP approach is that most of the signal reaching a satellite sensor from a dark object is contributed by the atmosphere at visible wavelengths. Therefore, the pixels from dark targets are indicators of the amount of upwelling path radiance in that band. The atmospheric path radiance adds to the surface radiance of the dark target, giving the target radiance at the sensor. The surface radiance of the dark target is approximated as having zero surface radiance or reflectance. A recent adaptation of the DP method is to assume a known non-zero surface reflectance of the dark target (Hadjimitsis et al. 2003). Several authors have shown how the DP approach can be used to determine the aerosol optical thickness (Griccs 1975; Kaufman and Sendra 1988; Kaufman et al. 1990; Hill and Sturm 1991; Gilabert et al. 1994). Hadjimitsis et al. (2003) found that two versions of the DP method have been widely used in any atmospheric correction procedure: the simplest one involves the assumption that dark areas have 0% target reflectance and the recorded reflectance corresponds to the effect of the atmosphere; the second states that the reflectance of a dark object (e.g. lake, ocean etc.) is low but not zero and an assumed value of surface reflectance (either obtained from ground measurements or from the literature) for that target can be used (Teillet and Fedosejevs 1995; Hadjimitsis 2008). The first version of the DP method is simple, and by ignoring atmospheric transmittance and diffuse sky irradiance, the atmospheric path radiance can be calculated. However with the second method, by using RT calculations, the aerosol optical depth can be determined (Teillet and Fedosejevs 1995). This paper describes briefly the derivation of a simple atmospheric correction procedure, which combines both the DOS principle and the basic radiative transfer calculations. Indeed, based on this new approach, by considering the ‘standard reflectance values’ at ground level of the selected dark targets, the aerosol optical thickness is determined. This approach is easy to implement and can be easily applied through the ERDAS IMAGINE 9.3 Modeller. The method incorporates the true reflectance value, which is acquired from in situ spectro-radiometric measurements of selected pseudo-invariant dark targets. Such targets can be asphalt areas, water treatment reservoirs or dams, which are common in any geographical area. The method combines both the basic principles of DOS and radiative transfer equations by incorporating in the calculations the aerosol single scattering phase function, single scattering albedo and water vapour absorption (i.e. relative humidity) values as acquired from several in situ measurements for similar areas in the vicinity of airports. Only the simplest method, the DOS (also known as the DP) correction method has been found to provide a reasonable and effective correction in the visible Landsat bands (1, 2 and 3) from the critical assessment made by Hadjimitsis et al. (2004) using ground spectro-radiometric measurements. The separate application of radiative transfer models, such as MODTRAN, 6S did not provide accurate results during this assessment study (Hadjimitsis et al. 2004). 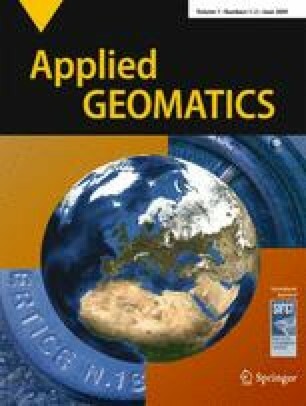 The need to develop a combined procedure in which empirical calculations will address the computation of several other atmospheric parameters through a certain procedure is apparent in this study. The extraction of aerosol optical thickness (AOT) from large-scale air pollution areas provides a mean to further assess the air pollution in these areas (Kaufman et al. 1990; Paronis and Sifakis 2003; Tulloch and Li 2004). The main sources of formation of aerosols (particulates) come from emissions of gasses mainly due to man-made and natural sources (Department of the Environment 1996). Several attempts have been made to assess atmospheric pollution by correlating the derived AOT with a number of inter-related air pollutants (for example, Sifakis and Deschamps 1992; Retalis 1998; Tulloch and Li 2004; Hadjimitsis 2008); however, the problem of how to relate AOT with suspended particulate matter near the ground and then to relate it with hazardous aerosol pollutants is still an open question (Gupta et al. 2006). Several researchers show how the columnar satellite-derived AOT values relate with surface PM2.5 mass measurements (van Donkelaar et al. 2006; Engel-Cox et al. 2006). Indeed, this AOT-PM2.5 relationship can be used to convert the satellite measurements to air quality indices. While satellites can provide reliable, repeated and synoptic measurements from space, monitoring surface level air pollution continues to be a challenge since most satellite measurements are column-integrated quantities. From previous research study in which an assessment of the available atmospheric correction algorithms, it has been found that the DOS works more efficiently for the wavelength region of 0.45–0.70 μm (Hadjimitsis et al. 2004). Landsat TM-5 is a very old sensor, its radiometric accuracy is compromised and, very likely, it will end its life shortly. Landsat ETM+ has severe acquisition problems; several lines of each swath are systematically replaced by simulated values. Moreover, there are no plans to replace these sensors in the forthcoming period. Indeed, there is a great need to use other sensors such as ASTER. The use of Earth observation to detect atmospheric pollution in different geographical areas and especially in cities has received considerable attention (for example, Kaufman and Frasrer 1983; Kaufman et al. 1990; Sifakis and Deschamps 1992; Retalis 1998; Retalis et al. 1998; Sifakis et al. 1998; Retalis et al. 1999; Wald and Balleynaud 1999; Wald et al. 1999; Hadjimitsis et al. 2002; Paronis and Sifakis 2003, Tulloch and Li 2004; Hadjimitsis and Clayton 2006; Hadjimitsis et al. 2007). All the studies have involved the determination of AOT and have used air pollution and meteorological data to support their findings. Kaufman et al. (1990) developed an algorithm for determining the AOT (using land and water dark targets) from the difference in the upward radiance recorded by the satellite between a clear and a hazy day. His method assumes that the surface reflectance between the clear day and the hazy day images does not change. Kaufman et al. (1990) recommended choosing images a short time apart and that solar zenith angles and observation angles should be as close as possible to avoid any effects of non-Lambertian surfaces, which might result in different reflectance values. Sifakis and Deschamps (1992) used SPOT images to estimate the distribution of air pollution in the city of Toulouse in France. They developed an equation to calculate the aerosol optical depth difference between one reference image (acquired under clear atmospheric conditions) and a polluted image. Their method was based on the fact that, after correction of solar and observation angle variations, the remaining deviation of apparent radiances is due to pollutants. Retalis (1998) and Retalis et al. (1999) showed that an assessment of the air pollution in Athens could be achieved using the Landsat TM band 1 by correlating the AOT with the acquired air pollutants. They developed a new algorithm based on the optical thickness (optical density) relationship found by Sifakis and Deschamps (1992) and on the fact that reflectances of images acquired within a limited time interval are not drastically changed. Wald and Baleynaud (1999) found that Landsat TM band 6 (thermal band) is highly correlated with the amount of black particulate. For estimating the effects of the atmosphere, it is necessary to model all the atmospheric mechanisms in relation with the at-satellite received radiance or reflectance. Most atmospheric correction methods are based on this approach and use radiative transfer calculations to solve this problem. It is essential to formulate a RT equation in which all the interaction processes that occur can be adequately described (Chandrasekhar 1960; Cracknell and Hayes 1993). By combining the RT calculations with the DP atmospheric correction method, the following steps have been used to derive the AOT. The procedure shown below has been presented for Landsat TM short wavelengths (TM band 1 and 2) and can be applied to ASTER band 1 images. Sturm (1981) reports that for most applications in remote sensing the approximate expression given below is sufficiently accurate. The aerosol single scattering albedo (ω a) denotes the ratio between the aerosol scattering coefficient and the total extinction coefficient (scattering + absorption) (Kaufman 1989). From measurements of the single scattering albedo at ground level, Waggoner et al. (1981) found for urban and residential areas ω a ranges from 0.73 to 0.87 and for remote areas ω a ranges from 0.89 to 0.95. The areas under investigation are considered as urban and suburban with residential regions, so a value of ω a = 0.80 is used here as approximation. If the aerosol single scattering albedo is equal to 1, this corresponds to a perfectly scattering aerosol (Chandrasekhar 1960). The aerosol phase function P a(μ 0) is difficult to be estimated accurately because of the great variability of aerosol particles. Several authors refer to the use of approximate relations for estimating the P a(μ 0) (Turner et al. 1971; Sturm 1981; Hill 1993). Turner et al. (1971) provide some graphs of these functions in terms of wavelength by considering a continental type aerosol. Forster (1984) used the graphical method of Turner et al. graphical method and suggested using P a (μ 0) at λ = 0.7 μm for all wavelengths, since the P a(μ 0) does not change significantly with wavelength. Another way to determine P a(μ 0) is to use the Henyey–Greenstein phase function (Gordon 1976; Gilabert et al. 1994; Kneizys et al. 1983, 1988; De Haan et al. 1991). However, many aerosols are characterised by a large amount of back scattering besides the strong forward scattering. This case is modelled by the Two-term Henyey–Greenstein phase function (TTHG) (Gordon et al. 1983; Gilabert et al. 1984; De Haan et al. 1991), which has been shown to agree with the Mie scattering theoretical calculations. In this proposed procedure, the TTHG equations were used. The remaining unknowns in Eq 2 are the AOT and the reflectance value of the dark target. The dark reflectance should be come from the range of ground measurements for some suitable dark calibration targets with non-variant reflectance values through the time. The spectral characteristics of such dark targets can be easily found in the literature or from other ground campaigns. By combining Eqs. 2, 3, 4, 5, 6, 7, 8 and 9 and solving for τ a, the optical thickness due to particulate matter (aerosols) can be calculated. The key parameters in the above suggested procedure are the at-satellite radiance from a dark object at ground level and the aerosol scattering phase function. In this case, the approximation parameters and the TTHG equation were used to model hazy atmosphere with continental aerosols (Gilabert et al. 1994; Hill and Sturm 1991). By selecting TM band 1, in which the absorption is assumed to be minimum, and by using images acquired over a short interval time (Kaufman et al. 1990) with a nearly constant range of relative humidity, scattering due to molecules and particulate matter were assumed to represent solely the atmospheric path radiance term. Furthermore, it was assumed that the water optical properties during the short period of times did not change dramatically. The suggested method is an empirical one based on theoretical calculations of atmospheric modelling. In order to make the computations manageable, certain approximations about atmospheric parameters such as aerosol single scattering phase function and single scattering albedo have been made. Based on the fact that, with atmospheric modelling, it is difficult to determine the real atmospheric conditions (Griccs 1975), some errors are expected. In the proposed method, secondary contributions to the atmospheric path radiance from the surrounded land are neglected. The method described in “Determination of the aerosol optical thickness”, was tested on two different geographical areas, the Lower Thames Valley area in the vicinity of Heathrow Airport (UK) and Paphos District (Cyprus) for determining the AOT for specific area of interest. Firstly, this method was applied to Landsat-5 TM Band 1 sub-scenes of Heathrow Airport area in the West London (see Fig. 1) acquired on 17 May 1985, 2 June 1985 and 4 July 1985 with similar solar zenith angles. This area consists of several inland water bodies, especially water storage reservoirs. Such reservoirs can be served as suitable dark targets for determining the AOT. The reservoir’s ground reflectance values were obtained from the ground measurement campaign performed by Hadjimitsis (1999) using a GER1500 field spectro-radiometer. The minimum reflectance value in TM band 1 from the range of ground reflectance values was selected. These reflectance values were compared with other spectral values found in the literature such as Arenz et al. (1996) for Colorado Front Range Reservoirs. Using the DP values (in radiance) found from the masked images of reservoirs, the Rayleigh optical thickness, Rayleigh and aerosol (TTHG) phase function, the AOT was determined for each image as shown Table 1. Visibility is closely related to the AOT, as shown by Forster (1984), Hadjimitsis and Clayton (2006) and Hadjimitsis et al. (2007). Therefore, the available visibility data found during the satellite overpass can be used as a tool for testing our determined AOT values. From Table 1, it is apparent that, in the image acquired on 4 July 1985, the AOT was significantly increased. High correlation was found by relating the visibility and determined AOT as shown by Hadjimitsis (1999). This means that aerosol concentrations might be increased on 4 July 85 due to high emissions from primary sources, such as road transport and industrial activities, which are the main sources of aerosol temporal variability (Department of the Environment 1996), but this needs further testing and investigation in the case where measurements of air pollutants are available. The chart provided by Forster (1984) for relating the AOT with the visibility values was used to assess the determined AOT using the proposed method. The visibility data found at the satellite overpasses in relation with the determined AOT and those found using Forster chart was in a general agreement. The method has been tested on two Landsat TM band 1 images (0.45–0.52 μm) and four ASTER (0.52–0.60 μm) images. 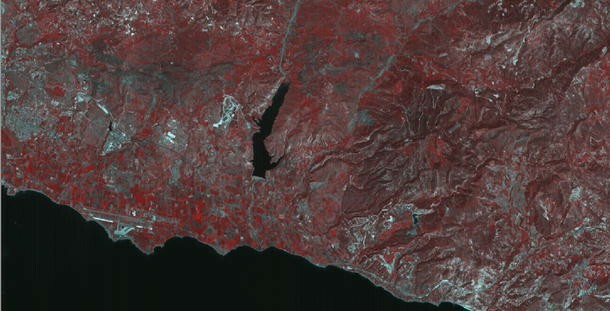 Two Landsat-5 TM band 1 images of an area of interests District near Paphos International Airport in Cyprus (see Fig. 2) acquired on 3rd of June 1985 and 11th of May 2000 were used. Despite the 15 years difference in acquisition, both images have very similar solar zenith angles. The area of interest is concentrated at Paphos District near Paphos International Airport in which air pollution due to aircraft movements and ground support equipment provides a number of different air pollution emission sources. Asprokremmos dam (surface area, 2.1 km2) characterised as eutrophic inland water (Hadjimitsis et al. 2000) was used as a dark target of determining the AOT. Reflectance values at ground level for Asprokremmos dam was taken from a series of ground measurements using a GER1500 field spectroradiometer during June 1999 campaign (Hadjimitsis 1999). The determined AOT found using the proposed techniques was in a general agreement with one found using the chart-technique presented by Forster (1984) for the Paphos area (Hadjimitsis 1999). 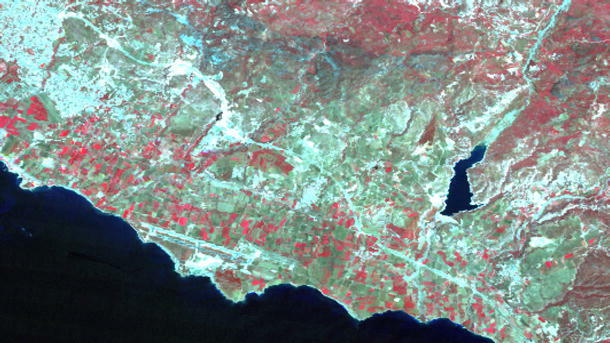 The proposed method has also been applied to ASTER images (0.52–0.60 μm) of the Paphos airport area for four images acquired on the 4th of February and 26th of February 2008, 17th of December and 24th of December 2007 (see Fig. 3). The selected dark targets were Asprokremmos Dam and an asphalt surface at Paphos Airport. Surface reflectance values of these targets were acquired from spectro-radiometric measurements obtained from a series of in situ recent and past campaigns (Hadjimitsis 1999; Hadjimitsis et al. 2009). Such targets have been found to be non-variant targets in that their reflectances do not change with time. For asphalt targets, the surface ground reflectance of 10.10% (asphalt) and 3.2% (dam) has been used, respectively. The determined AOT is shown in Table 2. The determined AOT found using the proposed technique was in general agreement with the one found using the chart-technique presented by Forster (1984) in which visibility values are plotted against the AOT from 0.45 to 1.1 µm. The proposed method has been applied to remove the atmospheric effects and determine the AOT from Landsat TM/ETM+ image data of the Paphos District area in Cyprus, acquired on the 20th of July, 5th of August 2008 and 13th of August 2008. Reflectance measurements for each of the calibration/validation targets were made during the satellite overpass using a GER 1500 spectroradiometer (300–1,100 nm; nominal dispersion, 1.5 nm; spectral resolution, 3 nm). A single sensor head was used fitted with a 4° lens. References to incident irradiance over a calibrated Spectralon™ panel were obtained for every three to ten target measurements, the frequency depending on the degree and change of cloud cover at the time of the measurement. The GER 1500 experimental data were filtered through the relative spectral response functions and averaged within the limits of the first four TM bands to yield the in-band reflectance values. The Microtops ΙΙ (Solar Light Company, USA) hand-held sun photometer that provides AOT (AOD) and columnar water vapour from instantaneous measurements, at five channels (440, 500, 670, 936, and 1,020 nm) was used in this study to determine the AOT. Other individual targets that are considered to be non-variant targets over time, such as large asphalt and whitish soil places, have been used to assess the accuracy of the proposed method. The reflectance values for each target for each image were calculated from the ground spectral measurements, and image reflectances were derived for corresponding pixels from the calibrated after-atmospheric correction image using the determined AOT from the proposed method (1–3 pure pixels). Overall, estimated reflectances were within ±2–3 reflectance units of actual reflectances. Indeed, by comparing the AOT obtained using the proposed method and those found using the sun-photometer, it is apparent that there is a very closed agreement between the two (see Table 3). This study provides a detailed description of the derivation of an atmospheric correction method that combines radiative transfer equations and the DP principle. It has been shown by Hadjimitsis et al. (2003) that the DP is the most suitable technique for removing the atmospheric effects from cloud-free images. Therefore, the use of the DP concept in the proposed methodology for determining the AOT increases the potential of the method. The extracted AOT from the reservoir system in the Lower Thames Valley area in the vicinity of Heathrow Airport can be used as an input parameter for models for monitoring air pollution after considering other parameters such as PM2.5, PM10 and TSP measured by standard ground air quality stations. This is a part of future research study. The proposed algorithm is useful when dark objects such as large eutrophic reservoirs or other inland waters or asphalt surfaces are present. The algorithm is fast, practical and can be used by researchers to quantify step-by-step all the parameters involved in the sensor–atmosphere–target interaction. The high correlation found between the visibility value at Heathrow Airport and the derived AOT increases the potential of the proposed method. Visibility has been found to be strongly correlated with AOT as shown in the literature (Forster 1984; Hadjimitsis 2008). This work shows a new method of determining the AOT using large eutrophic inland waters and asphalt places as suitable dark targets. The proposed methodology allows the determination of the AOT using Landsat TM and ASTER satellite remotely sensed images with acquired in short interval time. The proposed method has a number of advantages such as: ease of computation, such dark targets are common in many geographical areas; the method is image-based technique since the assumed dark target reflectance value can be found from the literature or other in-situ campaigns; and the methodology is a useful procedure for determining the AOT as a part of any atmospheric correction algorithm. The application of the proposed methodology in two different geographical areas increases the potential of this technique. Generally, results of proposed technique demonstrate the potential of earth observation to support the determination of aerosol variations in different geographical areas in which dark inland water bodies are located, such as areas in the vicinity of London Heathrow Airport area and Paphos International Airport area. Taken into account that the Heathrow Airport area is an attractive area for investigating air pollution due to the local busy aircraft and road transport levels, the use of satellite remote sensing imagery, which contains large water bodies such as reservoirs, is found to be an important tool for investigating air pollution. The retrieval of AOT can be useful in other studies such as atmospheric modelling of atmospheric effects and photochemical air pollution studies. The authors wish to acknowledge a grant from the Cyprus University of Technology for supporting this study. Thanks are also given to the Remote Sensing Laboratory of the Department of Civil Engineering and Geomatics (Cyprus University of Technology) (http//:www.cut.ac.cy/) for the provision of the GER 1500 field spectroradiometer and the Microtops II sunphotometer.